I’m a little confused. Isn’t Pepsi the choice of a new generation—the opposite of Coke’s “Real Thing”? Although the cola was first introduced in the 1890’s, this is a brand that challenges convention and attracts youth. Don’t get me wrong. I’m an advocate for the power of branding and most certainly packaging, but doesn’t a campaign need to support the brand? Shouldn’t the advertising theme at least mirror a brand’s equities? What is a Throwback? Much like the Cold War, awareness of the cola wars seem to have come and gone. Today’s beverage aisle is more fragmented and confusing than ever before. Maybe I’ve been following the category a little more closely since the failed redesign of Tropicana by Omnicom’s Peter Arnell, as well the group’s overhaul of many Pepsico’s other brands. Other than acknowledging something went drastically wrong with his redesign, I won’t make any further comment on Arnell’s methods (I’ll leave that to AdAge’s report from last year). But how does a Pepsi throwback really support the progressive brand in the category? Do retro campaigns help sell more product to the next generation or just pull on some nostalgic heartstrings of an older one? Does a sugared cola harken days gone past or provide a beachhead for a future free of corn syrup? Is Pepsi trying to attract consumers that have just had enough of chemical substitutes and just want simpler “real” products? Is a retro supposed to be healthier for us? Is Pepsico testing the waters with their own version of “New Coke”? Does a heritage offering support the Dr. Pepper brand better than Pepsi? Maybe this just another promotional gimmick to get packaging aficionados to purchase a limited-time pieces of packaging history from one of the world’s most iconic brands. I do know my basement is getting full of packages used to demonstrate anything from new product launches, refreshed brands, and unique line extensions, as well as technical mishaps. But this one still puzzles me. 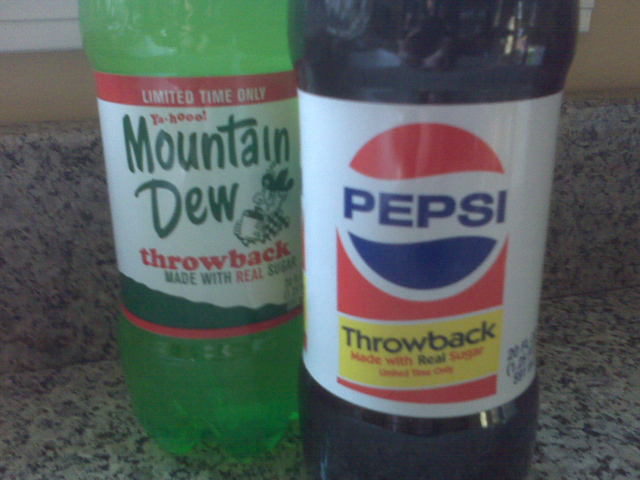 What does a Pepsi throwback represent? What do you think? Hurry, these throwbacks will only be available until February 22nd. If Pepsi was making the product with sugar as a permanent offering I would be cheering them on for such a positive marketing step. That the product is available only temporarily is a little confusing unless they’re just (ahem) testing the waters. The target market is probably skewed older for this move, or that would be my guess, as both the Baby Boomers and GenX are becoming more and more health conscious, and they are beginning to demand *real* sugar when they choose to have something sweet. The anti-HFCS movement is gaining in strength with HFCS now being banned in some nations. The anti-aspartame movement is growing larger and more powerful by the day as well. There’s no question that if you’re going to have a sweet cola drink, the safest and healthiest choice is one made with real sugar. A little bit of research online will show that there are cola drinkers who go out of their way to acquire colas made properly with sugar as it used to be. If Pepsi is actually listening and responding to the cola customer base then I would have to say that this is what good marketing is all about in my book. While going retro is a cliche, it still seems to be working for many.. Even music in India for instance; people are busy remixing old songs rather than creating new and the irony of it all is that this sells.. Even when we speak to people around; parents, teachers, bosses they all seem to be saying that their times were better, so guess the new generation that has been experimenting all along seems to be getting tired and settling for the tried and tested. If i had to be optimistic, even this could be part of experimenting and will wear-off.